>Also, because the system is so low impedance (0.75 ohms) and we aren't doing a real 4 wire resistance and voltage measurement, undoubtedly, some of the measured input power is actually making heat in the copper feed wires outside the calorimeter. So I guess this the reason why increasing power to the wire bundle while keeping the total power constant was decreasing temperatures, right? If with this setup some power gets wasted outside the reactor, this would also prevent even at a low level (for example, something like 10W inside/20W outside 0W inside/30W outside) cycling power while keeping the total constant to create an active internal H2 flux. It would be interesting to know if in CTC #2 which currently has a simpler wire setup, this would be doable or there would still be similar issues. 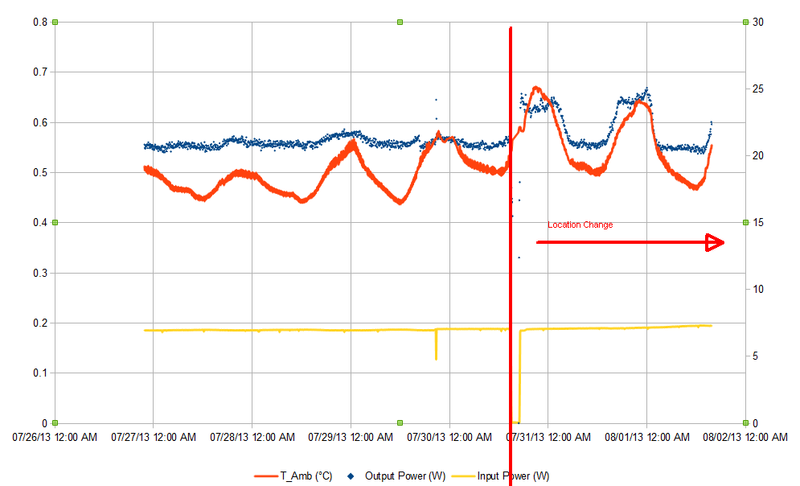 Yes, it appears that low of a voltage (~4 volts) the power supply can't push that much current. I guess we had never run it at that condition before. At higher voltage it can do a full 6 amps. Also, because the system is so low impedance (0.75 ohms) and we aren't doing a real 4 wire resistance and voltage measurement, undoubtedly, some of the measured input power is actually making heat in the copper feed wires outside the calorimeter. This test, therefore, has turned out rather un-useful. It wasn't hard to do, though, and was worth a try. So, I seem to understand that the power supply can't output much more than 4.0A, and since the wire has a rather low resistance (0.75-0.80 Ohm) this means that the amount of power that can be applied to it is limited, am I correct? This would also prevent the on-site 50m wire bundle oxidation protocol I previously suggested. Too bad, I was looking forward to seeing this experiment. Do you have anything planned on this regard? (for example using the same total wire length with a lower amount of wires). Either a glitch/artifact due to the unstable electrical characteristics of the wire, or something major is happening. Basically, below 650°C almost no oxidation happens on the wire in air. Increasing local temperatures to 950-1000°C speeds the oxidation process significantly. However above 1050°C the oxide layer sinters, sticks to the core, and maybe this is not what we want. What's interesting is that on the core wire copper atoms tend migrating to the surface during the oxidation process, forming Cu2O. This interesting for the test I suggested as CuO is very vulnerable to hydrogen attack at high temperature (>500°C). This should be able to produce plenty of defects, craters and cracks. - Take out power from the cell, vacuum out hydrogen. - Inject standard air. Can you inject compressed air? - Apply power to the 50m wire bundle so that it becomes glowing hot. It should glow orange-yellow. This could be performed without removing the wire from the stick. - Keep applying high power to the wire bundle for 3-4 hours. - Vacuum air from the cell. Don't apply a deep vacuum, and don't do it for too long. - Keep heating for 24-48 hours, observe any change in wire performance and characteristics. I think the power supply couldn't manage to keep up with it anymore and started feeding noise, which disrupts input power readings among other things. Still, it would be really interesting if input power on the wire bundle really was around 3W (as of writing). 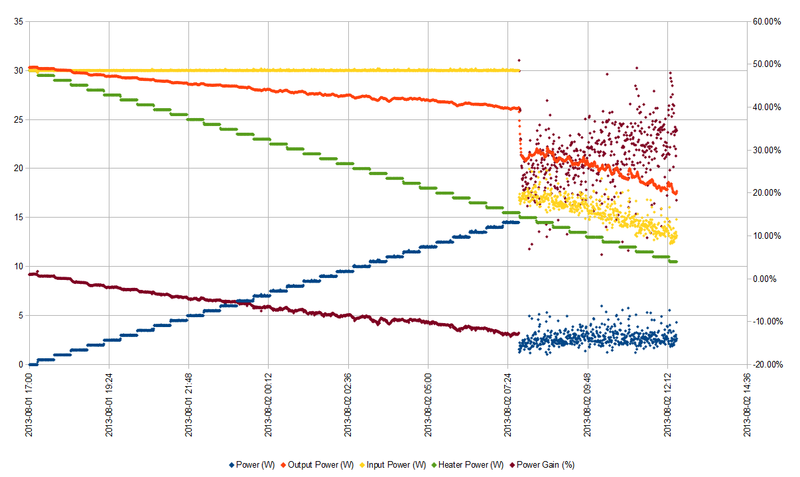 If that were the case, then it would mean that a significant amount of excess power (>20%) started getting produced. I doubt it is, however. It looks like live data stream to the public got broken about one hour ago. All US experiments at HugLab are being affected by this issue. @Ryan Hunt: it appears that the control algorithm for the current test isn't working correctly. Total input power is lower than 30W as there's less than 0.5W on the 50m wire bundle, unlike as expected for second step. Thanks for pointing that out, Ecco. We'll dig into that. @Ryan Hunt: thanks for the update.